Good Things Foundation is delighted to be working with Stockport Council, Starting Point Community Learning Partnership and The Prevention Alliance – and other organisations across the borough – to help thousands of Stockport residents lead better lives through digital. Across Stockport, 50,000 people still lack one or more of the essential digital skills they need to participate in today’s world. As well as this, people facing digital exclusion are much more likely to face social exclusion. Research shows that working-age adults in less well-off households are three times more likely as those in higher income and more educated households to be non-users of the internet (12% vs. 4%). Digital exclusion therefore compounds social exclusion, creating a double disadvantage that is leaving people behind as digital technology continues to transform our world. And with Universal Credit in Stockport rolling out this year – a benefit that requires people to claim online – it has never been more important that we ensure that people without digital skills aren’t being left behind. Good Things Foundation believes in a world where everyone can benefit from digital. We know that community support is the best way of helping people facing digital and social exclusion to engage with the digital world. From job clubs and community learning projects to healthy eating classes and homeless shelters, community organisations provide the trusted relationships and flexible support people need to overcome these barriers. 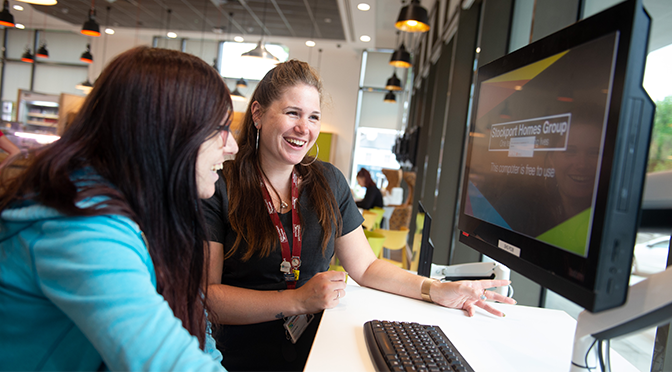 Since 2010, working with our partners in the Online Centres Network, we’ve helped 2.5 million people to engage with the digital world, with a range of positive impacts on employment, social connection and health and wellbeing. We’re applying this model in Stockport – and in other areas in the north of England – because we believe that by working with a range of partners in one place, we can have a big impact – increasing economic opportunity, reducing inequality and strengthening communities. In Stockport, we will create a local partnership of organisations and people all working to one common objective: to help Stockport’s most vulnerable and excluded residents have better lives through digital. By creating a new awareness of digital exclusion in the borough, and putting in place easy-to-find support, we will create a movement for digital inclusion across the borough. Working with Starting Point Community Partnership, based in Woodley, Stockport to recruit a network of community organisations targeting areas of the borough with the greatest digital exclusion, and equipping them with the skills and resources to help people engage with the digital world. Recruiting a stronger network of local Digital Champion volunteers able to support others in community locations. Building a wider partnership of organisations across Stockport – across the public, private and third sectors – that can raise awareness of digital exclusion and provide channels that refer people to the community offer. 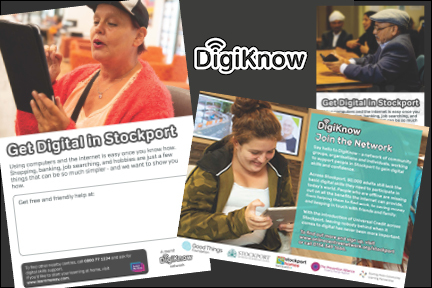 The programme is being delivered under the DigiKnow brand – developed by Stockport Council and partners – as we know this has a level of awareness in Stockport. We’ll be boosting awareness and making the brand more visible. We’ve created new promotional material and resources, to help recruit community organisations and support them to engage Stockport residents. We’ve used a variety of data sources on opportunity and deprivation, plus insight from our Stockport partners, to identify areas of the borough where support is most required – and we’ll be targeting them. And we’ve worked with Stockport organisations to create the awareness and commitment needed to take digital inclusion out across the borough, reaching the people who most need our support. DigiKnow provides an important opportunity to show how by working together across sectors and organisations, a place can transform the opportunity of its residents through digital. If you work in an organisation that’s delivering digital skills sessions, or would like to start doing so, we’d love to have you on board. It can be surprisingly simple to add digital skills training to your regular activities – by showing your cooking class how to search for recipes online, for example! Or if you can commit a little more time to helping people in your community to get online, sign up to be a DigiKnow Digital Champion. Find out more about how you can join our movement for digital inclusion on our Stockport web page. Which is also where you’ll soon find our map of DigiKnow organisations. We hope to put you on the map!